On August 7, 1998, three years before President George W. Bush declared a War on Terror, the radical Islamist group al-Qaeda bombed the American embassy in Nairobi, Kenya, where Prudence Bushnell was serving as U.S. ambassador, and Dar es Salaam, Tanzania. Terrorism, Betrayal, and Resilience is her account of what happened, how it happened, and its impact twenty years later. With heroes and villains aplenty, this riveting cold tale of the 1998 bombing of the U.S. embassy in Kenya has startling relevance. As today’s State Department struggles to survive gutting by its own government, Prudence Bushnell reminds us just how important and dangerous the job of diplomacy can be. 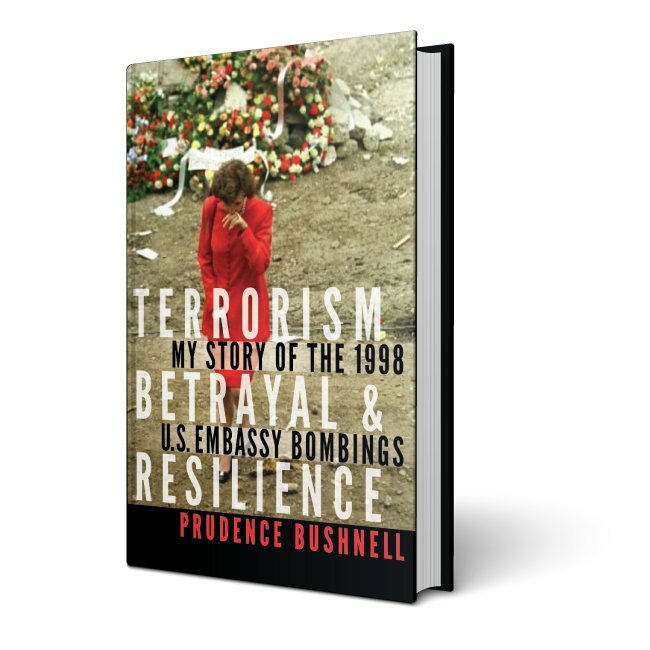 A gripping diplomatic thriller that tells the harrowing saga of the 1998 bombing of Embassy Nairobi, Ambassador Bushnell’s first-person account provides lessons of leadership, crisis management, and policy acumen. The tale dramatically illustrates the terrorism danger diplomats confront daily. Ambassador Prudence Bushnell is a true professional with the toughness, grit, courage, and compassion that marks the kind of superb leader you want in charge during a crisis. I witnessed her remarkable composure, even when personally injured, and her take-command leadership. This book is important for many reasons. It vividly presents a profile in courage; an understanding rarely appreciated for our foreign service men and women working in difficult assignments; a set of valuable lessons learned; and a case study in leadership during crisis. Every American should read this book. Prudence Bushnell’s name is not household familiar—but it should be. She was at the center of one of the most infamous terrorist attacks on American people and property in history. And she was a woman in the highest ranks of the State Department when such a thing was rare. She tells her story with integrity and intelligence—and gives lessons on leadership based on life experience. I inhaled Ambassador Bushnell’s new book. It is not just a gripping first-hand account of a devastating act of terrorism against the United States, but also a must-read treatise on the double-bind of women’s leadership. Through it all, Ambassador Bushnell brings the reader along–from her girlhood explorations abroad as a child of diplomats to her post-bombing fight for justice, this book is a rare opportunity to shadow one of America’s most respected diplomats as she reveals how she weighed major decisions of life and career in service to our nation. Readers of this book will emerge smarter and more informed about the complex, often undervalued work of diplomacy and the principled and courageous work of one of its most skilled practitioners. Jenna Ben-Yehuda, Founder, The Women's Foreign Policy Network. Former U.S. Ambassador and survivor of the 1998 embassy bombing in Kenya, Prudence Bushnell, tells that story in her gripping new book, with the emphasis on resilience, “Terrorism, Betrayal and Resilience.” Her book – Terrorism, Betrayal & Resilience – is amazingly relevant to today’s world, and proof that often the dust must settle before you can see clearly the truth.